It’s Valentine’s Day on Friday. I’m totally indifferent to Valentine’s Day — not against it, just indifferent to it — but I know a lot of people love it. And I can see why! It’s always nice to feel loved, or to make people feel loved. So even though I’m not really getting into the Valentine’s Day theme (apart from a special video — watch out for that on Friday), here’s my Valentine’s Guide for foodies. No sponsored links or PR involvement here – just things that I’ve seen and I like, that I thought you might like too. First up, one of my recipes. This is for Berry Hearts – puff pastry with a little whipped cream and fruit. Easy to make, and very pretty. Or, if you’re more a fan of cake than pastry, this recipe for cut-out heart cupcakes is GORGEOUS. And so pretty! Or you can use this clever how-to to make a circular cake and a square cake heart-shaped! 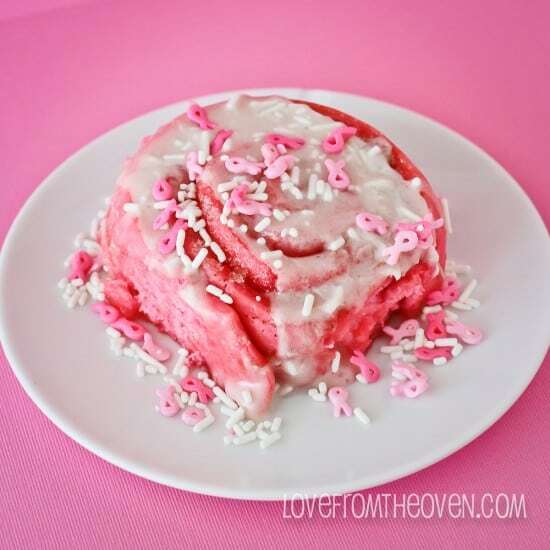 It’s you’re more of a bread fan, how about these pink Valentine themed cinnamon rolls? For something more elegant, these pavlova hearts with cream are beautiful. I love this trick with a cheesecake, a toothpick and some dots of food colouring. Dr. Oetker have a huge range of Valentine’s themed products if you fancy decorating your baking – pink or red food colouring, pink writing icing, pink writing gel, chocolate hearts, pink shimmer sugar, pink cupcake swirly icing…I have a cupboard full of stuff these guys have sent me, and their products have never let me down. They even have recipes you can follow, like this Valentine’s Chocolate Slab. If you prefer to give a traditional gift for Valentine’s rather than cooking something, here are some Valentine’s-themed foodie gifts. First, a Not On The High Street dump. I love all the personalised gifts they offer. Personalised mugs, anyone? (Left, right) Or personalised champagne flutes, if you’re fancy. …and this ADORABLE personalisable tea cosy. I know I just said I don’t do Valentine’s but Garry, if you’re reading this…? These “Made With Love” measuring spoons are utterly beautiful, and very useful for any baker as precision is key. You could get these heart-shaped measuring cups to go with it. These are from the British Heart Foundation, so it’s DOUBLY romantic and you’re also helping a good cause. Emma Bridgewater has lots of Valentine’s Day themed things – I particularly like this love-heart radio that you can stick an iPhone 4 into. Listening to the radio whilst pottering in the kitchen is one of my FAVOURITE activities, and being able to play your own music would be a huge benefit. It’s pricey at £130, but it’s lovely. Finally, and this is something I really, REALLY want (and in fact the inspiration for this post), get a Wrap-n-Mat. It’s basically a reusable sandwich bag, but they unfold so nicely into a picnic tray that you’d be able to whisk your sweetie away for a romantic picnic to use it. Get the red gingham one for extra Valentine’s Day points.